Have you ever wanted to have yummy, decadent treat for breakfast or pre workout. Well that’s exactly what you get in this way too yummy to be good for your breakfast brownie! Your cake and eat it too. Enjoy in good health, warmly nourished…body and soul. Yield: makes 10-12 brownies when cut into standard squares. Can get more if you cut smaller - bite sized. (I used organic almond butter and I stirred the oil back in before measuring). 1. Line a small pan – 8X8 with cling film. This will make it easier to get the batch out for cutting. Add all the ingredients to the food processor except the nuts or chocolate chips if using. Process until you see all the ingredients are mixed. You may have to scrape down the sides once or twice. 3. Put all of the mixture into your prepared pan and freeze until set. Could take 1 hour. Once set, remove from freezer and turn out onto a board and cut into squares. Place back into the container and return to the freezer for a firmer brownie or the fridge. What a treat! 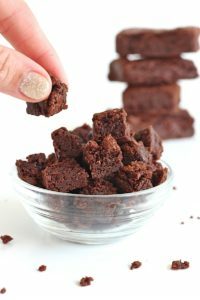 These raw brownies are such a lovely hit of chocolate yet they are healthy with good fats and fiber. This recipe makes a great option for a speedy breakfast on the run or an all-day snack. It’s got plant based protein, good fats, and good fiber (carbs). This is a true winner for any chocolate lover.